Constructed of 1000 denier nylon for maximum durability with individual magazine compartments that secure with quick-release fasteners . It is designed with a top belt loop and bottom leg strap for thigh carry. They are available in two sizes to hold three 9mm magazines up to 36 rounds or two 30 round . They have two adjustable elastic thigh straps and an adjustable top belt strap. 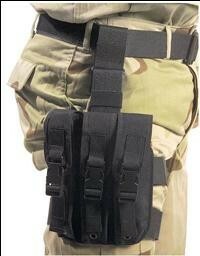 Can be worn tactical style on the thigh or remove top strap to wear on belt. Available in black only.